This mountain is the first summit in the long, high range that runs west and north from Katahdin around The Klondike Stream and is especially steep. From Katahdin Stream Campground, follow Hunt Trail for 1.1 mi. (approx. 45 mins) to a junction at 1500 feet. 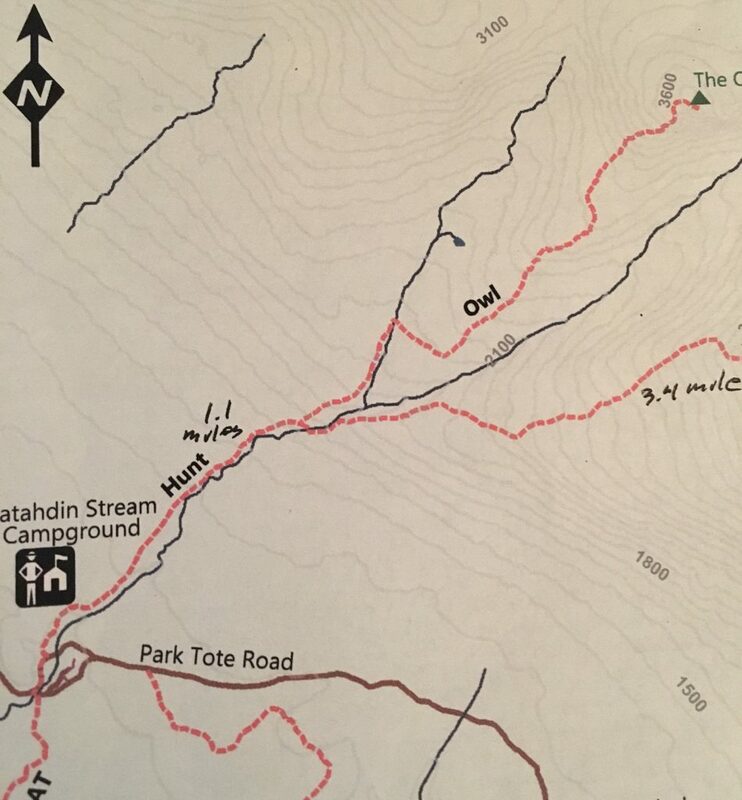 Here, The Owl Trail leads left at a point just before the crossing of Katahdin Stream. The trail then follows north the bank of a tributary before turning sharply right (southeast) and crossing the tributary at 1.6 miles (last source of water). The trail climbs gradually through dense spruce and fir and follows the western spur toward the summit. At 2.9 miles the trail rises steeply through a ravine and then across the upper part of The Owl’s prominent cliffs. At 3.4 miles the trail reaches the first outlook. After a more gradual climb, it reaches the summit at 3.5 miles. Views in all directions are outstanding, especially those into the Klondike and Witherle Ravine. The trail leaves Park Tote Road at Abol Campground. The trail passes through the campground and, at 0.2 miles, enters an old tote road to reach the southern bank of a tributary of Abol Stream. Abol Trail continues along the stream for 0.6 miles before the trail bears sharply right (northeast) away from the brook. The trail reaches a gravel wash of old Abol Slide (1.3 miles) and climbs to reach a second slide at 1.9 miles. Beyond this point, the route is steeper and is almost entirely bare rock and loose gravel. Large boulders and increasing steepness mark the latter part of this climb. 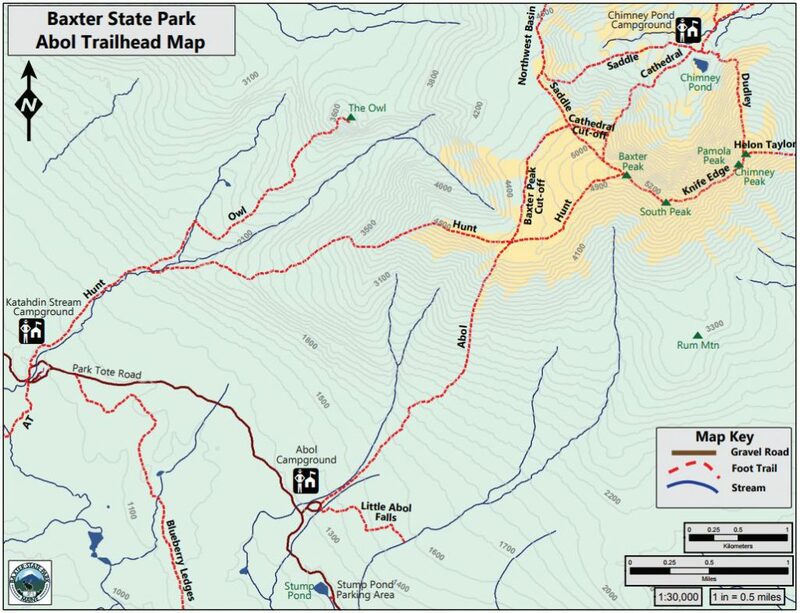 Upon reaching the tableland, the trail leads 0.1 miles to Thoreau Springs (unreliable water source) and the junction with Hunt Trail at 3.2 miles. Turn right on Hunt Trail and continue northeast up gentler slopes to the summit at Baxter Peak, which is reached in an additional 1.0 miles.